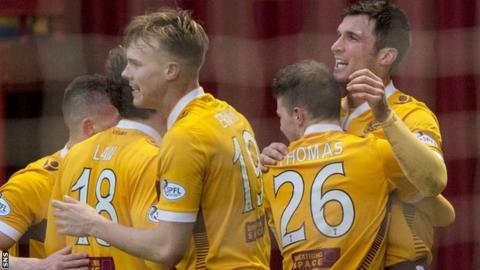 Motherwell 1-1 St Johnstone: Baraclough's men end "fear-factor"
Motherwell manager Ian Baraclough was pleased to see his side overcome a first-half "fear-factor" against St Johnstone at Fir Park. John Sutton's 75th-minute left-foot strike levelled the game after Murray Davidson had put the Perth men ahead. 'Well struggled early on, with debutant Louis Laing sent off for a last-man challenge on Saints' Chris Kane. "It is a point gained. We showed fantastic spirit to get back in the game," Baraclough told BBC Scotland. "There are two ways to go in that situation when you're a man down and a goal down - either curl up and accept it or you roll your sleeves up and ask questions. "We certainly asked questions. We were better; showed a togetherness and a willingness to work. It was a stark contrast to the first half. "The first half wasn't good enough. There was almost a fear-factor to get on the ball." Baraclough, whose side ended a five-game losing run, is undecided as to whether Motherwell will appeal against Laing's red card. The centre-back was signed on loan from Nottingham Forest on Friday and lasted only 25 minutes before referee Willie Collum dismissed him. "I've seen it again and I felt as though it was a coming together rather than an act where he's made him go down," said Baraclough. "Both eyes were on the ball and not on the player. For me, it was one that could have gone either way." Sutton's strike, on his weaker left foot, was his seventh goal of the season and Baraclough was equally happy with the set-up play by 18-year-old substitute Dom Thomas. "He came on, wanted to get on the ball and looked lively," he added. "He still has to learn about a lot of the game; when to run with it and when to pass it, but he did everything we asked of him." Meanwhile, St Johnstone manager Tommy Wright felt it was two points dropped and was frustrated about how they fell out the match. "We played really well until they went down to 10 men," he told BBC Scotland. "We were probably guilty of being wasteful and not working their goalkeeper hard enough. We didn't start the second half well and the longer it goes, it gives any team that bit of confidence. "We stopped doing the things that we did in the first half - moving the ball into wide areas and getting our full-backs high up the pitch - we stopped doing that for about 20 minutes."